Being great at content marketing was harder to do in 2016 than ever before. That’s because there’s more content in more places, with more topics and more faces. And that trend isn’t going to stop in 2017—it’s only going to multiply. The key is going to be understanding how to take a more nuanced, informed approach, so your content works smarter and harder. I asked my consulting team at Convince & Convert to create this guide to the content marketing trends that matter, based on our content marketing strategy work for some of the world’s most interesting brands. The result is this comprehensive, timely, and sometimes controversial guide. View or download below via Slideshare, and I’ve summarized the key points for you here as well. All brands must map all places and ways customers can interact and engage with them, and then provide optimal content – in multiple formats, ideally. This gives prospects and customers the information needed to take the next step, even in 2017’s crazy, non-linear “funnel” (which really isn’t a funnel at all but more like a bowl of behavioral spaghetti). According to Adobe, 40% of the average company’s revenue comes from current customers, yet just 2% of budget is spent on retention efforts. In 2017, smart content marketers will create more content for current customers, enhancing retention and triggering improved LTV and advocacy. Creating content solely for new customer acquisition is a dereliction of duty for content marketers, in our estimation. We’re not advocating “real-time marketing” in the Oreo dunk in the dark category, but rather fast, iterative, short, relevant content. You don’t need a full-blown film crew to make great video content. Do you really need your graphics team involved, or could you do it yourself with Canva (or similar)? My own Marketing Marvels show features live recordings of software demos, showcasing tools marketers will love. That kind of on-the-fly content creation would have been very difficult to execute in the recent past. With new tools, it’s a snap. Stop navel gazing and quit wasting time and budget making something 95% awesome when you could make it 88% awesome much faster and with less budget. Storytelling in business is all the rage. In fact, we talk about it every week on our Business of Story podcast — a great show hosted by Park Howell that is part of the Convince & Convert Podcast Network. But many of these “stories” are curated and polished like a rock in a tumbler, until you can see your own reflection in their pseudo-artifice. Now, the storytelling pendulum is about to swing back the other way. Millennials abhor falsehoods. And as Millennials become the dominant buying cohort for more and more companies, storytelling will become grounded in unvarnished truth. And the rise of live video will require brands to get comfortable with documentary style communications, warts and all. Look no further than Southwest Airlines’ use of Facebook Live to broadcast their COO talking to an angry mob of customers about their catastrophic outage. The new trend in content marketing is to create less content but to create better, more effective content. We don’t necessarily believe that less content equals better content, but that’s a different argument for a different post. But if you believe one of your 2017 priorities should be to boost the average efficacy and effectiveness of your content marketing executions, how do you go about doing that? Do you spend more time and money on each piece? We say absolutely not, based on Trend #3 above, on-the-fly content. Instead, the secret is content testing. Headline testing. Image testing. Conversion testing. A/B, multivariate, quickie focus groups using GutCheck and similar. Through the phenomenon of Pokemon Go, 2016 was the year augmented reality had its breakout moment. But remember that Snapchat’s filters and even Yelp’s “Monocle” feature have been around longer. AR is a fantastic way to add depth and relevance to your content marketing, and we’ll see many more case studies and examples in 2017. The story is much the same in VR, as organizations like Charity | Water and others are making persuasive virtual reality content that ads incredible power to storytelling. The economics of AR and VR are finally at the point where they are doable for most brands (and bands, as my good friend Art Haynie recently shot the first-ever VR concert for the Band Eagles of Death Metal. His how-to interview is fascinating). Marketing has always been about specialists: content marketers, social media marketers, email marketers, direct marketers, and so on. But not anymore. In 2017, we’ll see an increase in generalists, marketers who know a lot about a lot and serve a variety of roles and functions based on the project at hand. The best marketers in 2017 and beyond will have deep experience in one area, but will be cross-trained and capable in many other disciplines. SEO specialists that are also good at mobile video. Content strategists that also understand augmented reality. Email marketers that do their own analytics. This move toward generalists will impact the marketing org chart, how projects get done, and what software is necessary to track and manage it all. For more on the shift from specialists to generalists in marketing, read this post. What did we miss? 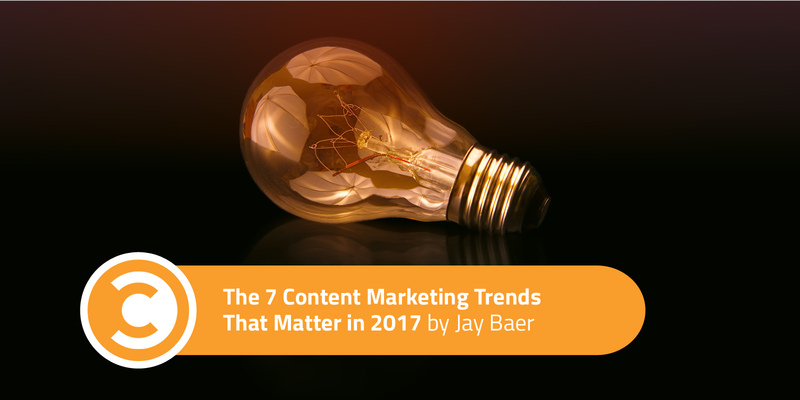 What content marketing trends do you think are critical in 2017? Let us know in the comments.